Despite celebrated on-track successes early in the 2014 season, the Russian-owned Marussia F1 team failed to stave off a financial collapse. Fans of F1 racing should take note: The demise of the Marussia team is symptomatic of wider failures in the regulation and running of the sport. Christmas came early for certain lucky (and wealthy) fans of F1 last year, when almost the entire inventory of Marussia F1’s Oxfordshire factory was put up for auction in mid-December. Those who missed out have another chance in 2015; this mother-of-all-yard-sales will continue on Jan. 21. The factory itself has been snapped up by American investor Gene Haas, who recently told AutoWeek that his employees have already begun operations at the site. Haas hopes to succeed where Marussia failed, by breaking into the ranks of F1’s top 10 constructors. Reading his interview with AutoWeek, in which the idea of sporting competition is replaced entirely with details of his proposed “business model,” one is inclined to feel that his potential success may be the sport’s loss. 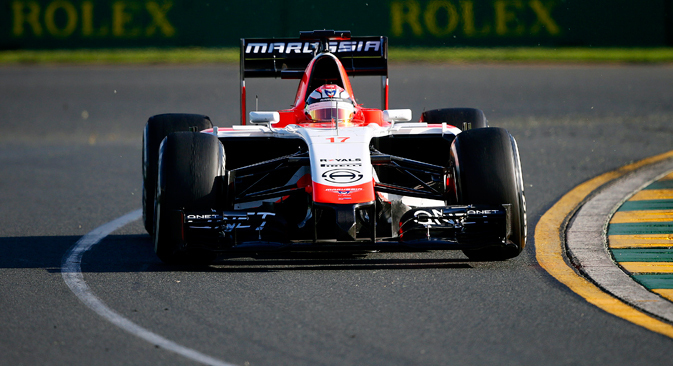 Which brings us to the question of the Marussia F1 team and how it reached its inglorious end. Marussia was an entirely British concern until the Russian firm Marussia Motors bought a controlling stake in the team in 2010. A number of design problems plagued the team’s first few racing seasons, but after it ironed out these difficulties and secured considerable talent in drivers Jules Bianchi and, to a lesser extent, Max Chilton, hopes were high that the team could earn their first-ever points in 2014. This they readily achieved, thanks to the outstanding performance of Bianchi on the streets of Monte Carlo in May. Despite receiving two five-second penalties, Bianchi’s aggressive driving secured a ninth-place position for a team many thought incapable of competing with the much greater resources of F1’s established constructors. This was the first time a Russia-financed team had ever won points in an F1 competition, and with the country’s first-ever F1 Grand Prix to be held in Sochi in October, Russia seemed to be making a grand entrance into the world’s most prestigious motorsports competition. Yet by the end of the year, that dream was left in tatters following a series of personal and financial tragedies. While Marussia’s financial woes had long been common knowledge to industry insiders, a strange game of musical chairs in the run up to the Belgian Grand Prix in August was the first indication for the wider public that something was awry. The team’s second driver, Max Chilton, announced at a press conference on the eve of the competition that he would not be driving for Marussia and was voluntarily stepping down “to allow the team to attract much needed funds by selling his seat.” American driver Alexander Rossi was briefly trotted out as his apparent replacement, but by the next day, an inexplicable U-turn saw Chilton back in the driving seat as if nothing had happened. Real tragedy struck soon after at the Japanese Grand Prix at Suzuka. Driving in poor weather conditions, Bianchi lost control of his Marussia at Suzuka’s difficult Dunlop curve and crashed into a crane that, contrary to any sane expectations of race safety, was assisting a German driver who had crashed at the same spot just one lap previously. It was later determined that Bianchi had suffered a “diffuse axonal injury,” a type of traumatic brain injury, and although he has been taken out of an artificially-induced coma and is now breathing on his own, he remains unconscious and in critical condition. Such was the backdrop to the Russian Grand Prix at Sochi, which followed only a week after the accident in Japan. Marussia entered with only one car, and a problem with the suspension early in the race forced Chilton to retire in the opening laps. This was the last time the team competed in the F1. Sochi, then, was both the beginning and end of Russia’s F1 ambitions. On the one hand, the new Russian Grand Prix is set to be a permanent feature of the F1 calendar until 2020. Furthermore, there are great hopes for the young Danil Kvyat to be the first-ever Russian driver to earn a place on a Grand Prix podium. On the other hand, with the demise of Marussia, Russia has lost its claim to be a serious participant in the constructors’ competition. Marussia’s decline is a loss that will be felt by more than just its Russian and British backers. Partly this is because the team had begun to cause something of a stir in 2014, with Bianchi’s driving in particular earning the team a reputation as a plucky underdog. More crucially, however, the collapse of the Anglo-Russian project is symptomatic of the stranglehold the top teams have on the sport. These teams maintain their position on the basis of vast budgets that new concerns cannot hope to meet. Of course start-ups can follow the model that Haas proposes, whereby they purchase both engine and chassis designs from existing teams. As with Haas’s other proposals for the sport, however, the problem with this idea is not in its eminent commercial viability, but rather in its unsportsmanlike dullness. Marussia’s failure, then, lay predominantly in the fact that its Russian backers finally balked at the vast liabilities the team had run up (over $90 million according to the bankruptcy administrators) without having delivered a kopek in prize money. Although this level of debt was unusually high even for the F1, Marussia’s fate is another indication, as if more were needed, that the level of spending across teams is out of control. This largesse threatens to stifle the positive influence of competition and fresh – the very values that have traditionally made F1 the world’s most exciting motorsport.